The source of inspiration of Cécile van Hanja is the Modernism at the beginning of the 20th century. She is especially interested in the architecture of Bauhaus and De Stijl as a reflection of order in a time of chaos. Her paintings are a result of an inner need to create order in a chaotic globalized world, in which the mass culture is the big winner. In her vision a work of art is an answer to the obtrusiveness of idealized advertisement aesthetics and a reaction to the avalanche of daily life impressions. By creating something unique and handmade art gives space to the individual. Her earliest childhood Cécile has spent in the South of France. When she moved at the age of 8 to the Netherlands it felt she was loosing her roots in an alien country. This feeling combined with the impressive man-made structure of her new homeland appeared to be essential for the artistic calling in her later paintings. From a birds eye view the Netherlands looks like a painting of Mondrian. The same straight lines one can find in Cécile's compositions. Combined with the transparant layers of paint this rhythmic pattern of verticals and horizontals creates a multi colored maze of spaces and look-throughs. 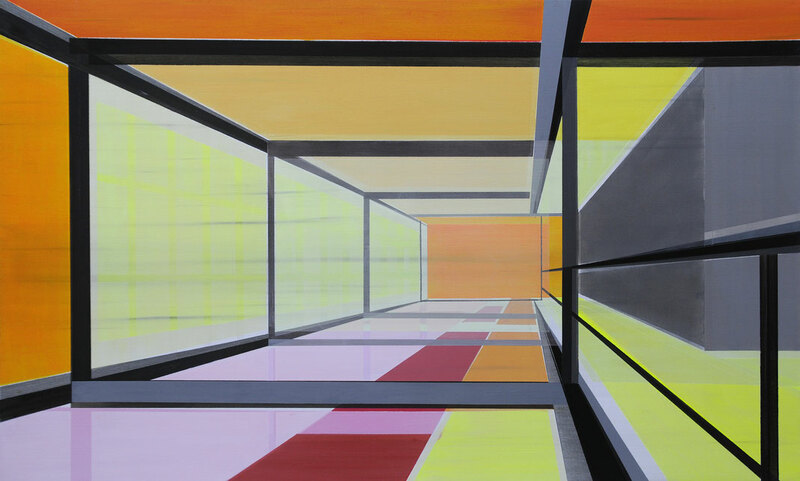 The transparant layered structure of the painting intensifies the depth. Thin layers of acrylic paint allow the colors underneath to shine through. The colors imagine the light in the painting. By painting the construction very fluidly she emphasizes its spaciousness and at the same time the immaterial aspect of the building. In Cécile's perception the house is a metaphor for the state of mind. Once started as a painter of empty interiors in Vermeer's tradition, she now focused her gaze on the outside. There is no man insight. The house or the lanscape around it radiates light. The stillness touche on suspense. For Cécile contemporary art is part of a binding story, a story that connects and create unity.